Rotorua's Must-See Wildlife Park. New Zealand bird, trout and wildlife park, along with a pride of African lions. 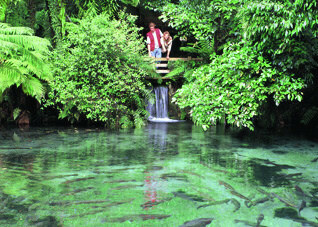 Paradise Valley Springs is set in a beautiful and well-maintained New Zealand native bush setting. The trout-filled Ngongotaha Stream winds through the park, and low fences mean lots of interaction with our wildlife. Interact with many animals that are found wild around New Zealand; animals such as deer, pigs, tahr and wallabies may be hand-fed. See rainbow and brown trout in our crystal-clear pools and wild in our trout stream. Get up close with our friendly farm animals in the lively streamside farmwalk: alpacas, emus, goats and sheep, to name a few. View native New Zealand birds like the kea and kakariki, and waterfowl on our wetland. Kea and possum feeding and talk happens at 3pm daily. ?Taste pure spring water straight from our natural spring, or take some of our own bottled 'Paradise Pure' away with you. Experience our elevated rainforest treetops walk, hidden six metres high among bush and huge native trees. Also get close to our pride of lions, and pat lion cubs when they are available. Lion feeding show at 2.30pm every day. Open every day of the year, including all public holidays from 8am till dark, with last entry at 5pm. 10 minutes drive from Rotorua city. All-weather attraction for all age groups. WE HOPE TO WELCOME YOU TO PARADISE SOON!.